Greetings to all of NMSU’s alumni and friends. 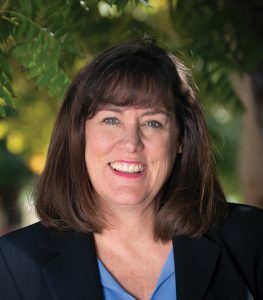 As I start my new role as NMSU Chancellor, I could not be more pleased nor inspired to be returning to my alma mater where I have so many fond memories and where the foundation was laid for my professional journey. We are fortunate that as a collective community of innovators, including NMSU faculty, staff and students, we are tremendously talented. We are bold in our thinking and in our work. I am confident this university is well-positioned to tackle the challenges ahead and to shape the future. Our top-level priorities are to improve student success, elevate research and creativity and amplify our outreach and economic development. With these priorities in mind, we will address fortifying K-16 education in New Mexico, creating healthy borders and modernizing our critical infrastructure with regard to water, food, energy, information technology and agriculture. Going forward, when it comes to our efforts at NMSU, you will begin to see and hear the phrase, “Be Bold. Shape the Future.” This is indicative of what is to come – we are bold, we are fearless. We will search for new innovation in the classroom, in the lab and outside of NMSU. We will deliver solutions for the future, creating change. I look forward to accomplishing this with each of you. It’s time for another great edition of Panorama, and we have incredible stories to share. 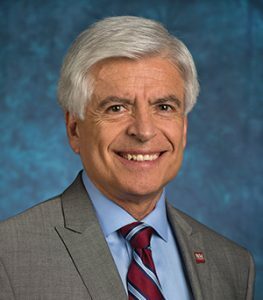 On behalf of the NMSU Alumni Association, we first want to welcome Chancellor Dan Arvizu back home and embrace President John Floros into our proud Aggie community. Along with our new leadership, we also recently welcomed thousands of alumni and friends to campus during Homecoming to celebrate Aggie traditions. Seven alumni received special honors for service in their communities and success in their careers, including our 2018 Distinguished Alumni – Dr. Rebeccah L. Brown ’86, Tara Jaramillo ’93 ’95, Dion Messer ’84, Rance C. Miles ’80, Eric Powell ’80 and Tommy Sheppard ’91 – and the James F. Cole Memorial Award for Service recipient, Dr. Patty Lopez ’80 ’82 ’89. When our alumni succeed, so does NMSU. For the sixth time in the last seven years, our university ranked as a top-tier institution by U.S. News & World Report, and the Center for World University Rankings also stacked NMSU in the top 4.3 percent of institutions worldwide. All of this success, in part, comes from our Aggie family who continues to invest in our students, faculty, programs and facilities throughout the NMSU system. As we near the final year of our “Ignite Aggie Discovery” campaign – the largest cash campaign in NMSU history – we ask for your continued support to help NMSU reach a goal of $125 million, including $50 million for student scholarships. There are thousands of students in need and numerous ways to give. Thank you to each and every one of you for getting involved and supporting your NMSU community. It’s a great day to be an Aggie! This issue of Panorama is produced by the office of Marketing and Communications, New Mexico State University, 575-646-3221. Las Cruces, NM 88003-3590 or panorama@nmsu.edu. Panorama is published two times annually. New Mexico State University is an equal opportunity, affirmative action employer and educator. The magazine can be found online at panorama.nmsu.edu.